Martes, Daga-as RUNRIO Trilogy's Best | JustRunLah! ELITE RUNNERS Christabel Martes and Jojie Daga-as emerged as the overall fastest participants at the conclusion of the 2017 RUNRIO Trilogy Philippine Marathon Sunday morning (October 1) at the SM Mall of Asia grounds. As a reward, both will represent the country in the prestigious 2018 Chicago Marathon. Martes, a former national athlete, assured herself of a ticket to the United States by ruling the 42.195-kilometer race that started at Okada Manila in a time of 3:03:28, almost 17 minutes faster than her closest pursuer Maricar Camacho (3:20:47). Third Place went to Lany Cardona in 3:23:29. 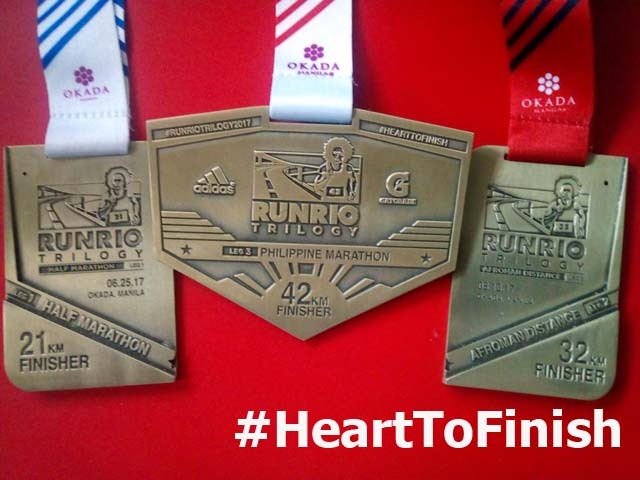 Adding her triumph in the 21-kilometer Leg One last June 25 and runner-up finish in the 32-kilometer Leg Two last August 13, Martes amassed a total time of 6:50:29. Her clocking was much faster than that of Daga-as of Team Soleus who clocked 7:12:57 over the three races. Although he did not go home with a podium finish after battling a platoon of five Kenyans, Daga-as’ consistent placing within the Top 10 of each leg was enough for him to earn the honor reserved for Filipinos only. Team Kenya as expected swept the podium led by Eric Chepsiror (2:23:20) and followed by his countrymen Dominic Lagat (2:25:39) and Joseph Mururi (2:34:43). In the side events, Lel Kipchirchir of Team Kenya (1:07:09) and Ailene Tolentino of the Philippine Army (1:37:00) emerged as champions of the 21-kilometer Half-Marathon. 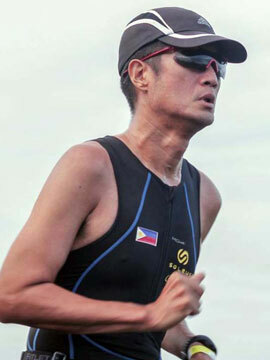 Before the race, Tolentino was seen as Martes’ closest rival owing to her triumph in Leg Two but her decision to race 21 kilometers removed her from consideration. Team Kenya also took home honors in the 10 kilometers thanks to Elphiz Kiptarus (31:30) while Lyca Sarmiento was the champion in the distaff side (44:28). Raymond Lopez (15:25) and Leonalyn Raterta (20:18) were the fastest over five kilometers. A runner must complete the longest distances in each leg – 21, 32 and 42 kilometers – in order to be a candidate for a slot in the Chicago Marathon. All successful Trilogy participants will be invited to a special celebration and awarding ceremony within the first quarter of 2018 and just before he next Trilogy fires off.